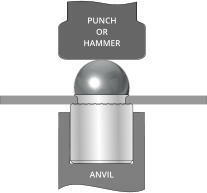 Mini Rivet Bush Standoffs provide strong reusable captivated threads in a spacer format for thin panels. 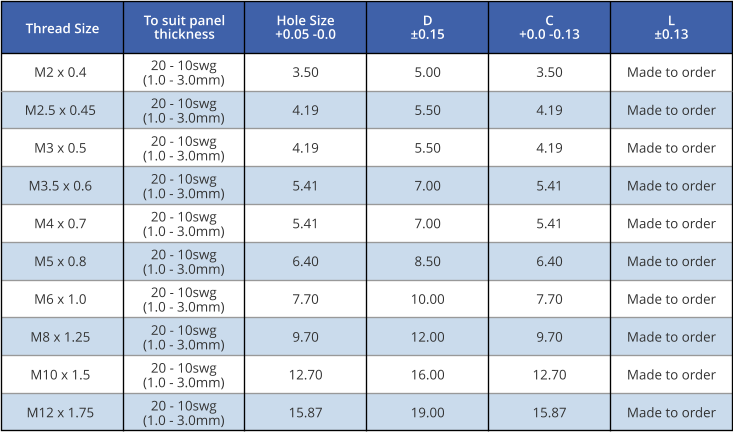 They can be installed into panels as thin as 0.5mm and do not suffer from the maximum hardness or centreline to edge limitations of self-clinching nuts so are suitable for installation into panels of any hardness such as hard stainless steels or in close to edge applications. Featuring a knurled, this style of smaller rivet bush offers good torque to turn resistance while maintaining good spigot strength to resist pull-out. Manufactured to suit a specific panel thickness, we can manufacture parts with custom dimensions to suit your particular application. Available from stock in metric thread sizes in steel, electro zinc plated steel and stainless steel. We can also supply Unified, BA, BSW and BSP thread sizes subject to minimum order quantities. 316 stainless steel, aluminium and brass rivet bushes are available to order subject to minimum order quantities. 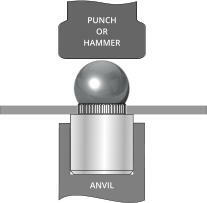 Ideally Rivet Bushes should be installed using a press with a suitability profiled punch by applying a parallel squeezing force, however they can be installed using a hammer and ball bearing to form the spigot profile.